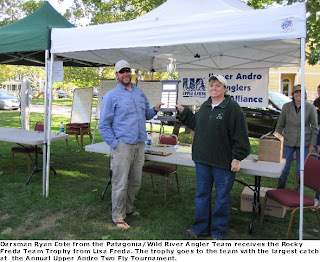 Team Patagonia/Wild River Angler will defend its title. This great event serves to raise funds for the Upper Andro Anglers Alliance, a group dedicated to the restoration, preservation, and promotion of the Upper Androscoggin River fishery. No, the point is not really about the competition, but there are some really nice prizes for the "winners." Last year there were rods and reels from LL Bean and Orvis, gift cards for Kittery Trading Post, and of course some sweet schwag from Patagonia, including a Guide Water wading jacket and waders. Despite whether you go home loaded up on booty or empty handed, the river and the fish will be better off for it. Read all about last years event. "The contest is scheduled from 6:00 am to 2:00 pm (sunrise 6:34) on Saturday, September 18, 2009. Rain or shine. Each team consists of two anglers and an oarsman. Fishing from drift boats only. No wade fishing. Anglers will be fishing for three species of trout-brown, brook and rainbow. Small mouth, fall fish (chub) or any other species will not be accepted. Teams are responsible for their Maine and/or NH State Fishing Licenses, cameras and digital images. UAAA will supply a retractable measuring tape, fish cards, and bag lunch. Awards will be presented to the angler with the biggest fish, greatest number of fish caught and for the team catching the greatest number of fish. The oarsman may fish for pleasure only. Oarsman’s name and team will be engraved on The Rocky Freda Turtle Water Perpetual trophy for team with the greatest catch." See you there, we'll be the guys posing for photos with the Turtle Trophy!